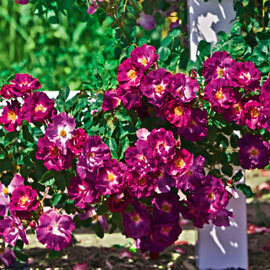 Clusters of deep smoky purple, double flowers are touched with cloudy white. 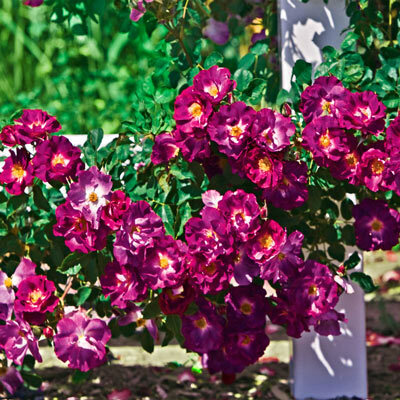 Blooming from late spring to fall, this climbing rose provides a nice contrast to orange, yellow and white flowers. Grows 10-12 ft. tall with a 4-6 ft. spread. Full sun to partial shade. Zones 4-10. Bareroot No. 1 to 1-1/2 grade. 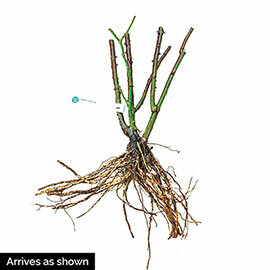 Depth: Plant at the same level as the soil so the crown of the plant is even with the soil level. Do not bury the crown. Color: smoky purple-blue highlighted by a touch of cloud white and sunny gold peeking out of the center. Flowers assume bluer shade in cooler weather. Foliage: Glossy dark green foliage. Flower Form: Distinctive colored flowers with a spicy scent.